The term “meat and potatoes” conjures up a definite image for most of us. Meals that are straightforward, comforting, and a little rugged. It signifies family and home and hard work. Even the most elitist food snob would hesitate to deride the heart-warming appeal of this homely culinary couple. 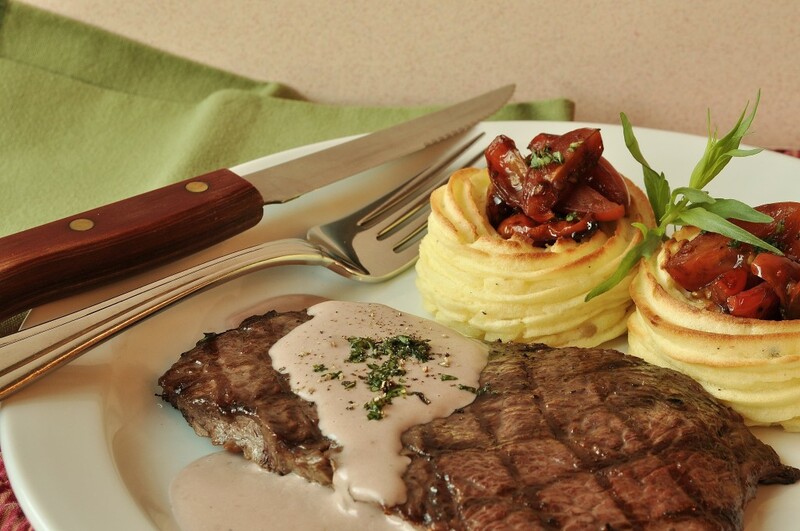 This meal is an example of meat-and-potatoes in its dressed-up guise. Frenchified, naturally, and accented with cream and egg yolk, instead of a skinny belt and long chandelier earrings. 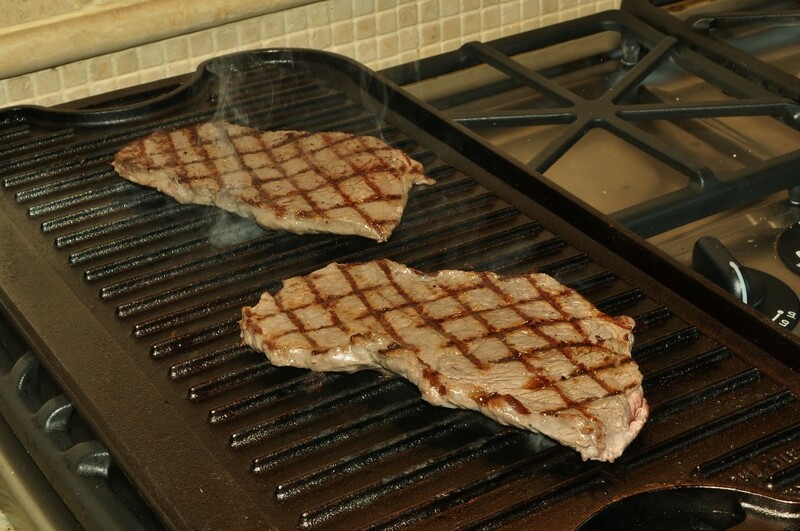 My only excuse for this meal is that I wanted to try grilling steaks on my cast-iron griddle. It was not a special occasion, and it doesn’t have to be for you to try making it either. It is simple enough to pull off in an hour, thus allowing you to dazzle your family with your prowess in the kitchen, even on an ordinary weeknight. These duchesse potatoes are a traditional French preparation that I learned in culinary school, which I love because they are as beautiful as they are delicious. Although if you pipe the mixture into these nest shapes, the name changes from duchesse to marquise. Confusing, isn’t it? Now, proper marquise potatoes are filled with a mixture of diced tomatoes and shallots, but I chose to sauté cherry tomatoes in olive oil, deglaze the pan with balsamic vinegar, and then reduce the liquid to a sweet, sticky glaze on the tomatoes before piling them into the potato nests instead. 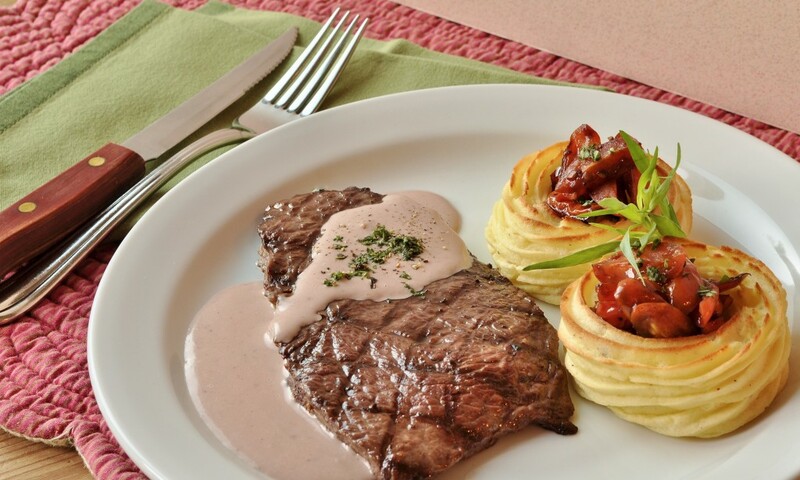 I also made a red wine-tarragon cream sauce (hence the lovely pink color) for the steaks, but I think a nice peppercorn sauce with a touch of brandy would be even better. 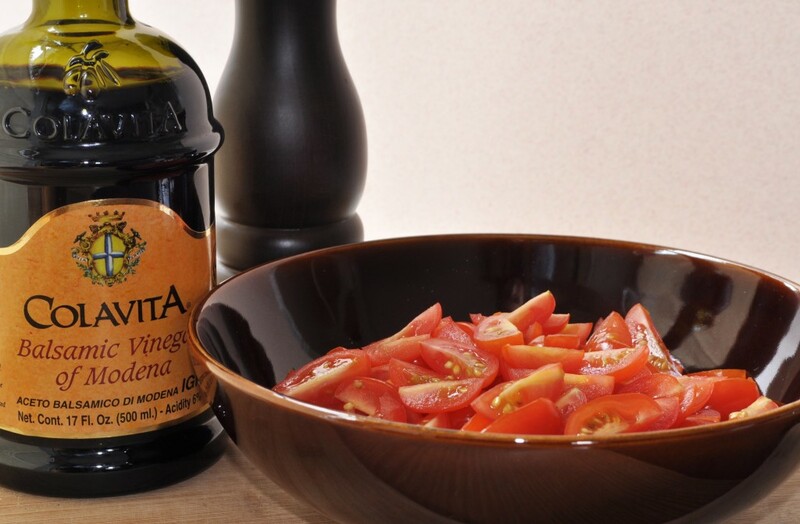 Of course, it really doesn’t matter what kind of sauce you make, everyone will still be impressed. Meat and potatoes has a sophisticated side after all. You can pipe the duchesse mixture into any shape you please, but if you do the nests that I’ve done here, the proper name is marquise. Preheat the oven to 400°F (200°C). Line a sheet pan with parchment paper and set aside. Cut the peeled potatoes into small, even chunks. Place them in a large saucepan and cover with cold water. Add 1 teaspoon of the salt. Place the pan on the stove and bring to a boil over high heat. Then turn down the heat and let the potatoes simmer until tender when pierced with a knife, about 15 minutes. Pour the potatoes into a colander and let them drain thoroughly. Return them to the pan and place it back on the stove over low heat. Dry out the potatoes for a few minutes, stirring occasionally with a wooden spoon. If the potatoes start falling apart when you stir them, don’t worry. You’re about to mash them anyway. Transfer the potatoes to a large bowl and mash until smooth and free of any lumps. If you have a potato ricer or food mill, use that to puree the potatoes. Add the egg yolks and butter to the hot potato puree and mix well. Once the butter has melted and the mixture is completely incorporated, add the remaining teaspoon of salt and season with nutmeg and black pepper to taste. Fill the piping bag with a portion of the duchesse mixture. Don’t add too much at once: the potato mixture is heavy, and if you overfill the bag, you will have a difficult time piping it. Pipe the mixture onto the parchment-lined sheet pan. To form nests: pipe a disc about 2 ½ inches in diameter, starting in the center and then spiraling out from there. Then pipe around the edge of the disc a few times to build up a “wall” about 1 ¼ inches high. Repeat with the remaining duchesse mixture. You should get 12 nests. Place the sheet pan in the preheated oven and bake until the nests are tinged with golden, about 25 minutes. 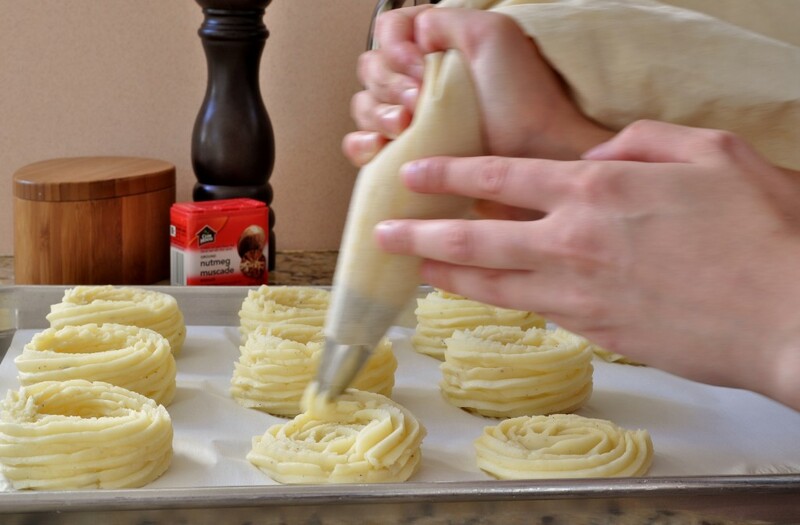 Note: The potato mixture has to be piped while it is still hot, but the baked nests can be stored in the refrigerator for three or four days, and then reheated before serving. They also taste delicious cold, but that would lessen the sophistication factor! Can the duchess potatoes be made ahead and frozen? Yes, I think they would freeze quite well. And then just thaw them and reheat in a moderately low oven before serving.